You’re gonna have to figure that out for yourself. Life is a box of chocolates, Forrest. You never know what you’re gonna get. I feel like the proud parent sending their child off to college…..or leaving an organization for a new and hopefully better adventure…..For many, the experience of the “empty nest” syndrome includes saying goodbye and letting go (maybe my colleague Bev Kaye’s best selling book should really have been more accurately titled “Love Em and Lose Em Anyway“). 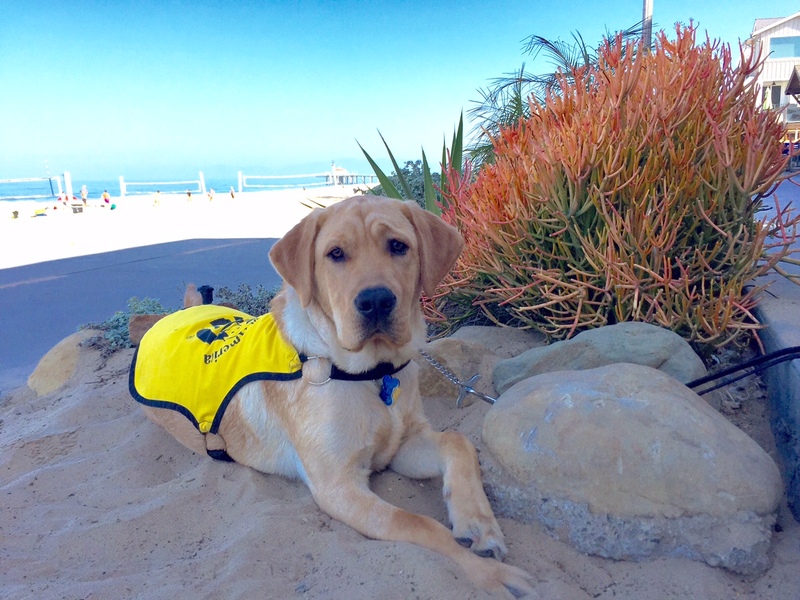 As a three-time puppy raiser, we knew this day was coming soon….This weekend we turned our 13-month old guide dog puppy named Enzo back to Guide Dogs of America (GDA) for the beginning of his formal training as he climbs his goal ladder to become a guide dog for someone with a sight disability. It’s hard to say goodbye after picking him up when he was only six weeks old but knowing what our role was in helping him accomplish his career goal. Formal training takes about three to four months depending on how they do. There is no visiting during this time but the puppy raiser can call to see how their puppy is doing while in training. The ultimate reward for the puppy raisers is to meet the blind recipient of the dog they raised at the Graduation Ceremony where they hand the harness to them to begin their new life together (yea, there are few tears here). For those of you who don’t know, guide dogs are completely free to those with a sight disability and it takes about $45,000.00+ to raise each guide dog and partner training (not to mention our puppy raiser costs to replace two pairs of expensive prescription sunglasses and a smartphone which I relied on for the GPS genie who constantly yelled at me that she was “recalculating”). I guess the question most frequently asked of us as others see us with our guide dog puppy is, “Isn’t it hard to say goodbye?” As William Bridges suggested about life transitions, we all move through three stages of individual and organizational change: 1) Endings (saying goodbye); 2) Changes (exploration); and 3) New Beginnings (moving forward). 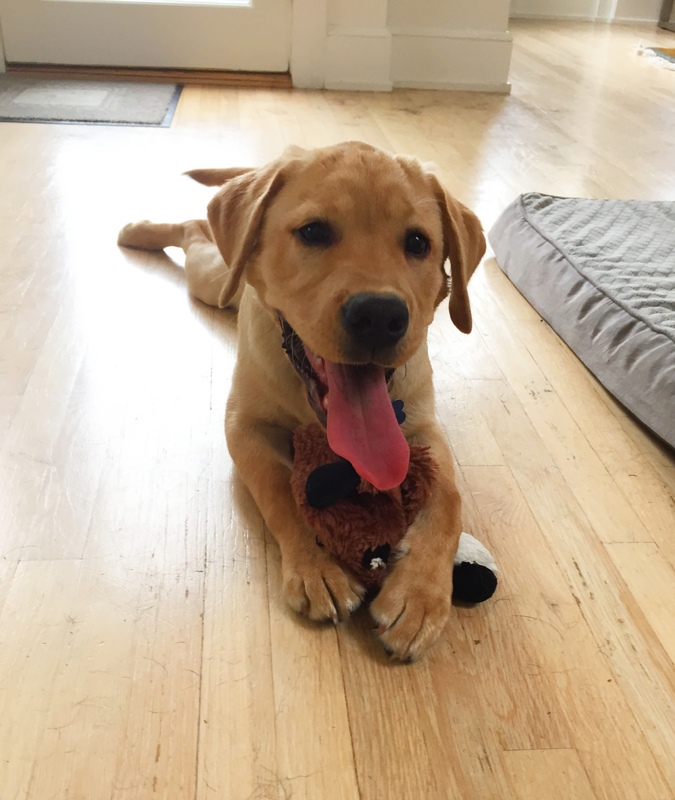 Enzo has been a wonderful symbol for the coaching and talent development work that I do as all of us from time to time truly need a “guide dog” to help us see ourselves and our world more clearly and help clarify these stages of change. What helps us cope with saying goodbye is knowing that his goal is to become a partner with someone who will rely on his training and skills to do the very things each day that many of take for granted. Enzo has offered to me many lessons that are useful and practical for leaders and talent at levels of organizations. Saying “goodbye” has made me reflect on how we all move ahead on the “goal ladder of success” and his journey ahead certainly will be inspirational to me. The “best of the best” in any profession have a long-term focus but certainly celebrate short-term accomplishments1. Focusing on the long term allows us to cope with inevitable minor set backs and defeats and keeps our sights where the end of your journey might take you. With Enzo, we have always kept our “eye on the prize” of ultimately helping him to become a guide dog. We have celebrated all the small things he has done to get ready for his big journey ahead. Previous research suggests that when people hold learning goals to increase their competence and skills they seek more challenges than when they hold performance goals to master their performance2. “Winning isn’t everything; it’s the only thing” is a well-known quote in sports but those who focus on the journey of becoming better seem to be even more motivated to learn, experiment and grow professionally and personally. To become good or the “best of the best” you have to be open to constant “feedforward” so that you leverage what you do well and make sure you sharpen the skills in your “blind spots.” Insight is a gift but without feedback from others and an openness to solicit it and truly try to understand and accept it, you will always need a guide dog along the road of life. Asking what I can do more, less or differently from those we love and respect at work and home will help us to grow and develop to become as successful as our genetic set-points will allow us to be. Enzo has been a wonderful metaphor for many leaders I coach who truly seem to be “blind” to the impact of their behavior on others and how they are perceived. There is a lot of popular writing about how practice makes the difference between being an expert versus having expertise (e.g., 10,000 hours). However, recent research tends to suggest that expert performance isn’t solely a reflection of deliberate practice but dependent on the possession of certain base line abilities3. I can’t tell you how many times we have practiced the basic commands (e.g., sit, down, stay, etc.) with Enzo but watching his brothers and sisters at our puppy raiser classes always gave us a glimpse of his genetic DNA. So, deliberate practice will make you better, but only up to a point. After that, you just become more automatic at your maximum level inherent capabilities4. Focusing on remaining tasks/actions influences the success of moving up the goal ladder compared to celebrating actions that have been completed. In two studies the authors found support for this hypothesis and found that a focus on completed actions increase satisfaction derived from the present level that one is at but not that helpful to move to the next level5. Monitoring remaining actions signals a need for future progress–people feel more committed and have a higher level of aspiration to achieve more. In contrast, focusing on completed activities signals that the current goal was important but those who do seem to express a lower interest in advancing to a higher level of goal pursuit. Progress oriented people want to move up and ahead in their life and careers and tend to increase the level of challenge, rather than, receive external rewards and disengage from the goal. I already miss Enzo but will always remember what he taught me and how he helped enlighten my life….I will keep you posted about how he does with his formal training over the next few months on his journey to become the “eyes” for someone special who will rely on his training and skills that we had such a very small role in shaping….Anyone interested in making a donation to help Guide Dogs of America can click on this link…..Be well…. Missing loved ones is the only part of growth and moving forward that I really don’t like. Great post.